Clover is a leading and competitive branded consumer goods and products group operating in South Africa and other selected African countries with core competencies in the production of dairy and nonalcoholic beverage consumer products; the distribution of chilled and ambient consumer products; and the sales and merchandising of fast-moving consumer goods. Clover has a strong and rich history that is based in KwaZulu-Natal (KZN). Clover began way back in 1898 with a series of meetings among a group of farmers in the lush pastures of the Natal Midlands.  1898: Farmers met at Mooi River to discuss the establishment of a butter factory. At follow up meetings the name Natal Creamer Ltd and co-operative principles were approved.  1899: Joseph Baynes started the first butter factory in Natal on his farm Nel's Rust. Due to the absence of proper legal channels to register a co-operative Natal Creamery Ltd was registered under the Natal Companies Act and H Blaker was appointed first Chairman.  1901: The first reference is made to Model Dairy as a partnership between Natal Creamery Ltd and Joseph Baynes Ltd for the marketing of fresh milk in Durban. 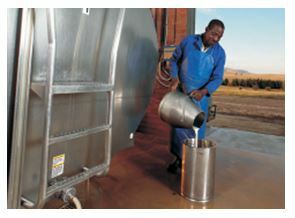  1902: Milk distribution by Natal Creamery Ltd commences in Pietermaritzburg. 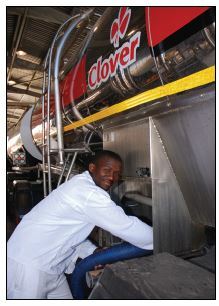 Today, Clover procures over 600 million litres of milk annually, of which 52% is procured from KZN. This high quality, delicious milk is distributed and sold across South Africa as milk, cream, concentrated dairy products and beverages. KZN is still a strong-hold for Clover products, accounting for 14% of Clover's revenue. Clover also displays a strong market share in KwaZulu-Natal, holding the number one spot in six of the categories in which it plays. Clover is gaining market share in yoghurt and custard which are relatively new launches. Clover's largest beverages brand, Tropika, was launched first in KZN in 1984. Tropika is made from a combination of fruit juice and dairy, which results in a unique smooth tasting beverage. After 30 years in the South African market, Tropika is still the market leader and the bestselling dairy fruit mix in South Africa. Tropika has a turnover of over R1bn with volumes in excess of 100 million litres per year. KZN currently contributes 30% of total Tropika volumes. Clover has added a host of new brands such as Manhattan Ice Tea and brand extensions including sliced cheeses and milk variants. It has also become a distributor for products such as Nestlé Pure Life water, Red Bull, two other diary brands -- DairyBelle and Good Hope -- and carbonated soft drink maker Frankie's. Clover has two factories in KZN - at Queensburgh and Pinetown, employing a total of 1255 factory workers across these two factories. The next big step for Clover -- the "dairy industrial park" -- is planned for construction in Mooi River. It will cost R1.5bn and CEO Johan Vorster says it has strong government support, but still requires some capital support and some "off-take" support from partner industries. The park, if it gets built, will produce baby food products and will provide a host of export opportunities and import replacement opportunities because no baby food base products are made in Africa. Clover Mama Afrika Trust was started eleven years ago in 2004. Over the past years, Clover Mama Afrika has established a reputation for being one of the country's most innovative, effective and sustainable corporate investment programmes, bringing tangible benefits to the people it aims to uplift. The Clover Mama Afrika initiative has set out to restore some of the best aspects of African tradition into modern life, such as caring for one another, passing on skills and protecting the young, the weak, the aged as well as HIV/ AIDS victims. Currently, the Clover Mama Afrika project has 41 Mamas countrywide who collectively care for over 15 500 children and more than 2 500 elderly across the whole of South Africa. The awards have been flowing too. Clover made the top 30 most well-known brands a few years ago and came in the top five last year. It was the winner of Reader's Digest's Most Trusted Brands for 2015. In addition, Clover has won many advertising awards including Loerie awards, Apex awards, Sunday Times Top Brands awards (including rated 5th in SA overall, a Grand Prix award, in 2015), Generation Next Sunday Times Youth Survey awards, Product of the Year awards, Icon Brand awards, PMR Africa awards, SA Dairy Championship awards, Quality awards, Reader's Digest most Trusted Brand awards, Kasi Brand Star awards, a SAFTA award for Little Big Cook Off, a webby award for website design (Way Better campaign) and a Mobius award. After years of staff uncertainty, Clover was ranked third in auditing firm Deloitte's Best Company to Work for survey in 2014. The crowning achievement was winning the 2016 Global RepTrak Pulse survey for the most reputable company in the country. Services / Products: Clover Industries Limited, a branded foods and beverages Group, has enjoyed a long and successful history as part of the development of South Africa's dairy and fast moving consumer goods industry. Clover - Are You Ready For Clover's Little Big Cook Off?